This breed typically has a small to medium sized, muscular body with medium leg and tail length. The head is round with predominant cheekbones and a well developed muzzle and chin. The ears are medium in size with slightly rounded tips and the eyes are large and wide-set apart. The coat is generally short, dense and coarse with individual hairs being either crimped, bent or hooked. In some individuals, the whisker hairs are also crimped. This breed is available in up to 27 color variations and patterns. The American Wirehair is generally considered an affectionate, people-oriented cat that loves to play but is not hyperactive or clingy. Wirehair cats shed in the spring and fall like other cats, but due to the delicate nature of the coat, they not be brushed. They may require bathing due to oily skin. The unusual coat of the American Wirehair is delicate and hairs can easily break or fall out with brushing or stress. Occasional bathing may be necessary due to their oily skin. Some of these cats may suffer from skin-related allergies. 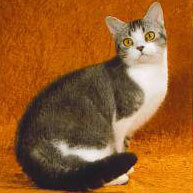 The American Wirehair was the result of a naturally occurring mutation. This genetic mishap was first discovered in a litter of kittens born to ordinary feline parents in Verona, New York, in 1966. Two (a male and a female) out of these five kittens born survived a predatory attack and where bred back to each other to produce more "wirehaired" cats. To maintain genetic vigor, American Shorthair cats were later bred into the Wirehair line over time. This outcross had some influences on the shape of the head and body while maintaining the desired wire coat.